English and Japanese (target language) are on the same side, the other side is blank. 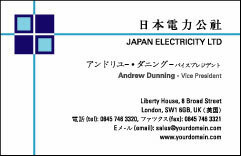 At Lotus Graphics we are experts in the preparation of culturally appropriate business cards for visitors to China, Japan, and Korea. We can match the graphic layout from your existing English-language card so that your cards retain a consistent and professional look, projecting a uniform corporate identity. If you dont already have a design you can choose one of ours - we can still include your company logo. 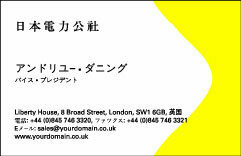 We supply the translation and layout, together with top quality printing if required. Alternatively, use our express file service which guarantees to have your card ready within 3 days. Its quick and easy, you can order online. You can also pay online, if you wish, at no extra cost, via PayPal, an extremely secure and reputable e-commerce service that puts the highest priority on the privacy and security of clients. (PayPal is owned by eBay.) We dont just translate your card, we ensure that the design as a whole is linguistically and culturally appropriate, so you'll get the most out of each and every business meeting. Our comprehensive one-stop package includes: cultural review and adaptation of your card, professional translation of your card into the local language of your destination, typesetting of both languages with identical formatting in each, and emailed proof of the draft for your review and approval. Localized business cards are an indispensable tool for anyone doing business in China, Japan or Korea, and to be caught without them is a serious breach of business etiquette and a major social blunder. Without them your trip will be a series of awkward moments. 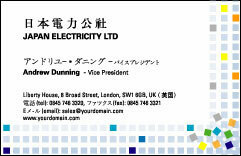 With them you will demonstrate that you are taking your business in East Asia seriously. Offering your clients and business associates your business card in their native language shows that you understand and respect their culture. Its also an important way of ensuring that your company, title, and other crucial information is communicated accurately and impressively. In the East, even more than in other parts of the world, it is essential to establish your group identity and your position within that group. A bilingual card will do more than identify you as an individual, it will explain your status and help you to create that all-important first impression. Making this small effort is sure to pay big dividends, theres no more cost-effective investment you could make to ensure the success of your trip. Cards are exchanged at the beginning of a meeting; make sure you have enough available for everyone. On receiving a business card from a Chinese, Japanese or Korean person you should nod your head to show respect and you should also express thanks for the opportunity of meeting them. Review your counterpart's card carefully, you might want to speak his/her name and position out loud to be sure of the correct pronunciation, and then put the card away, perhaps in a wallet or shirt pocket, but dont shove it in your back pocket. It is also preferable to present your card to a new acquaintance before you ask for theirs, and it is considered polite to use both hands when giving or receiving a card, or anything else. A gentle nod of the head is fine when meeting people similar to you in age or rank, but with senior individuals you should make the gesture more like a bow, and stay down for a brief moment. You should also be sure to stand up when exchanging cards with a senior person. East Asians hand out their business card at the drop of a hat. Don't be left out!